Bowling game lovers are enthusiastic about the game and organize competitions between various players. In any form of the game, you need a Bowling Score Sheet to keep track of the match. These sheets have a general format with the name of the bowler and points. There are separate spaces for remarks and other details related to every single throw. 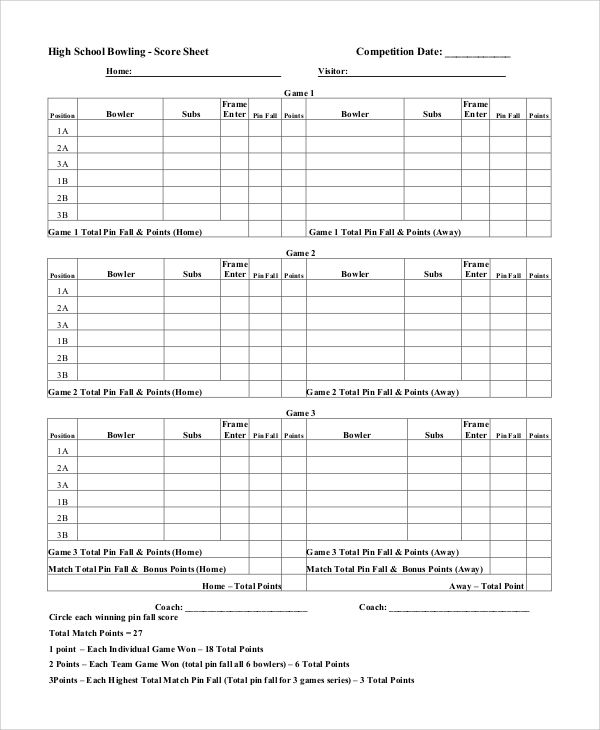 These sheets can be customized as per the requirement, and here are some common Sample Baseball Score Sheets that are used by sports enthusiasts. Since high school bowling games are not too professional, the pattern followed there is quite generic. 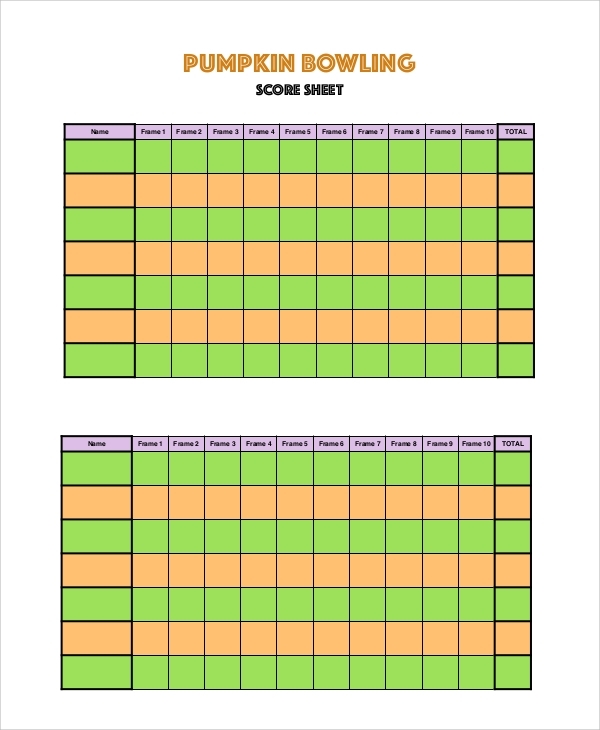 The name of the bowler, points and other details are provided in the sheet for multiple games. 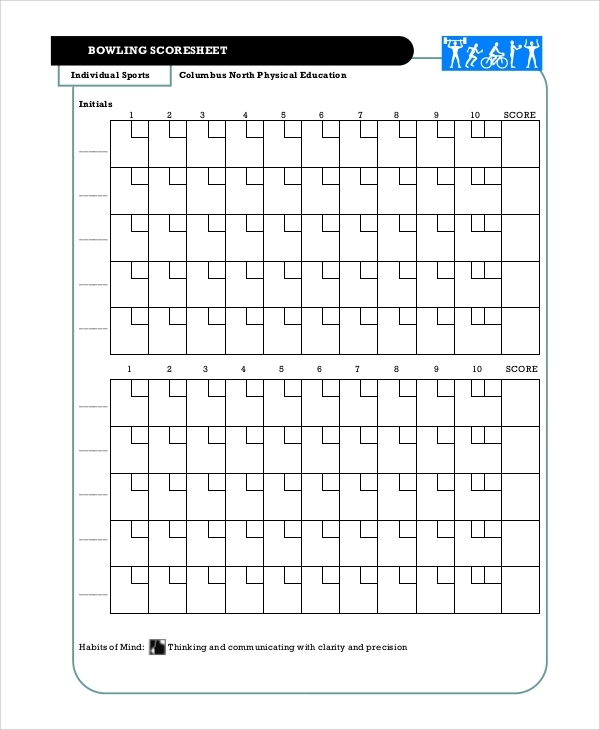 This sheet is to be used for practise purposes. There are ten different scenarios presented in the sheet with ten frames. It contains all other details of a regular game. This sheet is devoid of any specific customization. The names of the bowlers, total and ten different frames are formatted in different colours. Tailoring it according to the purpose is easy. 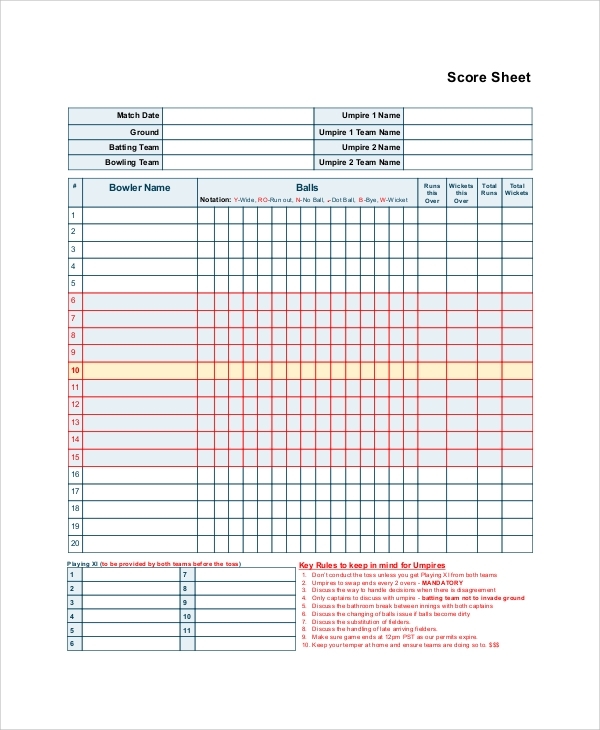 What is the Importance of a Bowling Score Sheet? A bowling score sheet is required when you want to keep a systematic record of the game. It is commonly used in games like ten pins bowling and other bowling games. Since the game is quite popular, it is necessary to keep an account of the different players and their performances in the game. It helps to do away with confusion and imparts a systematic concept to the game. You can also see the Sample Cricket Score Sheets. Competitions are commonly held between different groups, and when multiple games are played, it is difficult to keep a record of the players mentally or even on a white paper. Thus, these sheets are very useful for gaming purposes. 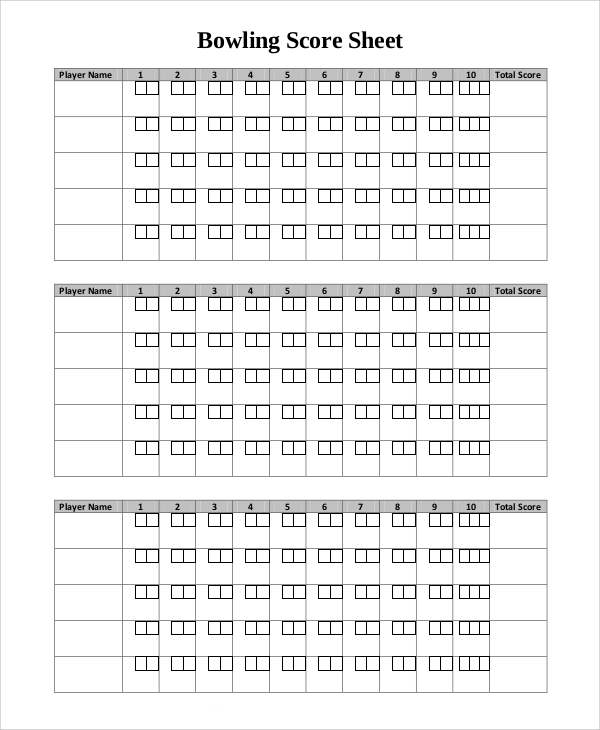 This sheet is required when a tournament is organized. There are spaces for the score of different games, cumulative totals, average and so on. It is easy to compare between different matches here. This sheet is made ready to be printed when the charts are filled up. The name of the bowler, frames and totals are presented in a professional format. There are ten frames in the sheet. You can also see the Sample Scrabble Score Sheets. Who Needs a Bowling Score Sheet? 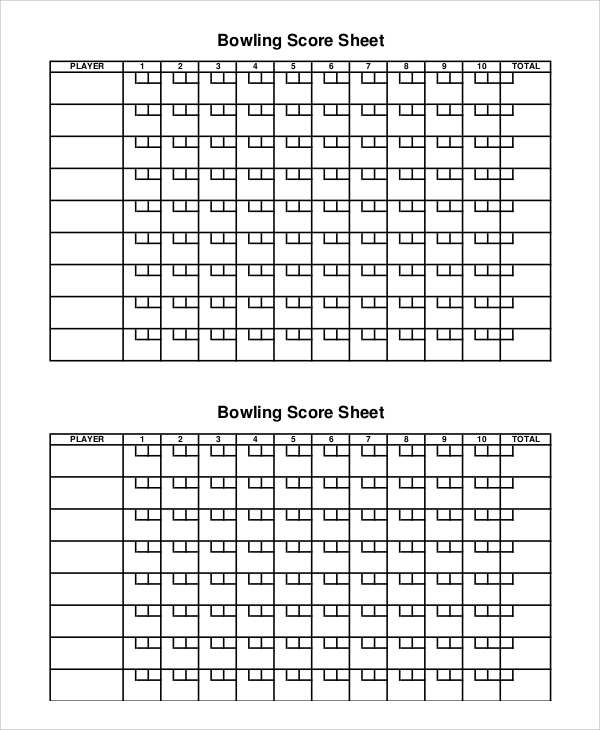 A bowling score sheet is commonly required by the organizers of the games and scorers. Firstly, the sheets are customized for entering the points of each player. They are summed up at the end of the game. The people who calculate the scores and compare the performances are concerned with the cumulative average and comparative edge of a player over the other. You can also see the Tennis Score Sheet Samples. Especially, when there are multiple games, it ‘s hard to calculate the average and points. The sheets are formatted in such a way that the required calculations can be done easily and the results are calculated with the help of these sheets. 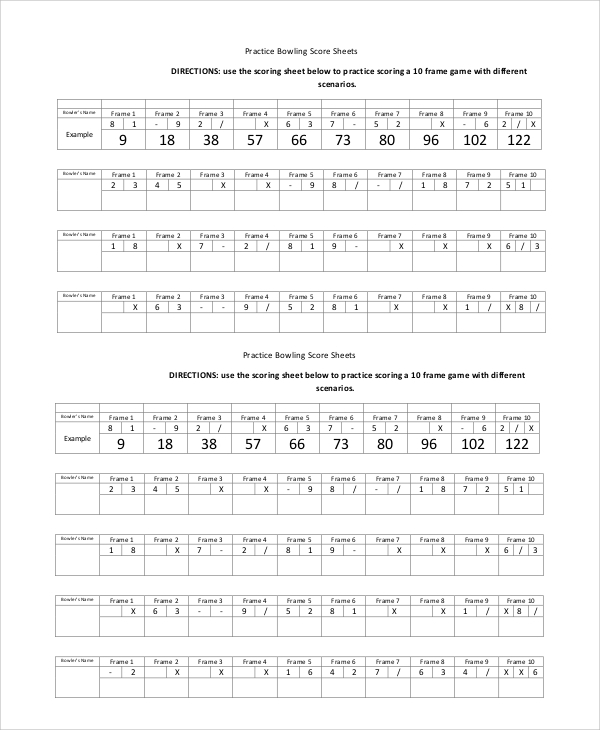 There are different formats according to which bowling score sheets can be designed. These can also be tailored for single and multiple games. 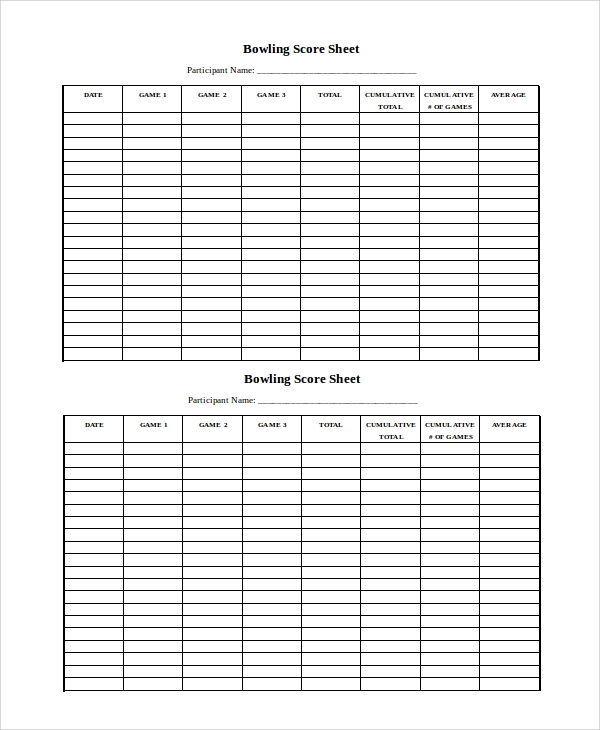 You may browse the website for different formats of bowling score sheets like the Sample Estimate Sheets. These sheets can be easily altered and customized as per the requirement of the users.